Although federal regulations do not allow a student pilot to carry passengers, the student pilot and a passenger departed from a private airstrip on a personal flight in the airplane. During the flight, the passenger posted on social media a video that showed the airplane maneuvering at low altitude. The airplane subsequently impacted a cornfield at high speed. Examination of the airframe and engine revealed no evidence of mechanical malfunctions or failures that would have precluded normal operation. Toxicology testing of specimens from the student pilot indicated the use of multiple psychoactive drugs, including alprazolam, cocaine, ethanol, and hydroxyzine. The combined effects of these drugs likely impaired his ability to safely perform low-altitude maneuvers. The student pilot's reckless flying attitude and use of multiple psychoactive drugs, which likely impaired his ability to maintain clearance from terrain while maneuvering at low altitude. On September 14, 2016, about 0915 eastern daylight time, a Piper PA-11 airplane, N4910M, impacted terrain while maneuvering near Arcanum, Ohio. The student pilot and the passenger were fatally injured, and the airplane was substantially damaged. The airplane was registered to a private individual and operated by the student pilot under the provisions of Title 14 Code of Federal Regulations Part 91 as a personal flight. Day visual meteorological conditions existed at the time of the accident. The local flight departed without a flight plan from a private grass airstrip about 0800. According to onboard video posted by the passenger to social media during the flight, the student pilot was in the front seat, and the passenger was in the rear seat. On several occasions, the onboard video showed the airplane maneuvering at a low altitude. While in flight, the passenger texted to a friend that the pilot was flying in a "crazy" manner. A witness, who was in his car preparing to leave for work, observed the airplane fly by his residence at "tree top" level. After exiting his car to check if the airplane had missed the trees, he saw the airplane enter a turn and descend out of sight. Another witness noticed the airplane flying low "just above the trees." A third witness stated that the airplane was flying in a "very radical" manner and commented, "it was like the pilot was drunk." 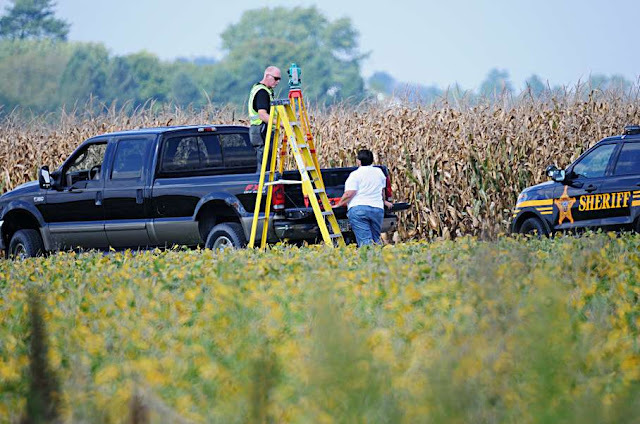 The airplane subsequently impacted in a cornfield about 300 yards north of the departure airstrip. The student pilot, age 20, was issued a Federal Aviation Administration (FAA) third-class medical certificate on October 16, 2012. A logbook review revealed his initial solo flight occurred on December 23, 2012. He had accumulated 31 total hours, and the last recorded flight was on May 22, 2015. FAA regulations do not permit a student pilot to carry passengers. 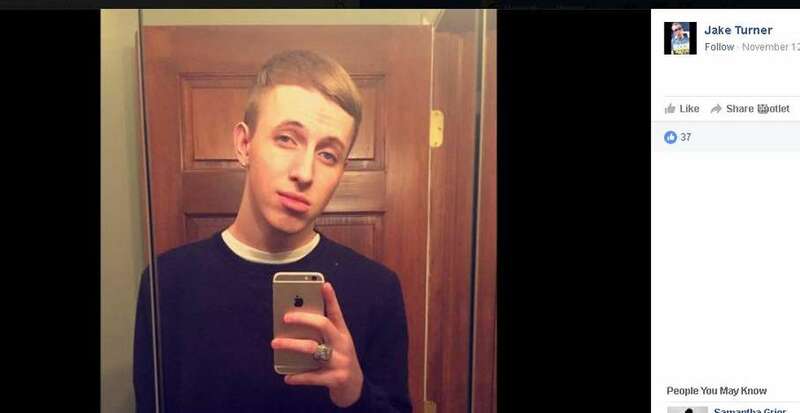 According to multiple people interviewed by local law enforcement officials, 2 weeks before the accident, the student pilot returned from a substance abuse rehabilitation facility where he was treated for heroin addiction for about 30 days. The airplane, which was registered to the pilot's father, was manufactured in 1947. The two-place, tandem, high-wing airplane was equipped with a Continental C85-12 engine and a Sensenich fixed-pitch propeller. Review of maintenance records revealed that the most recent annual inspection was completed on Aug 31, 2014, at a total time of 1,925 hours. At 0915, the weather observation station at Darke County Airport, Versailles, Ohio, located about 13 miles north of the accident site, reported wind 360° at 4 knots, 7 miles visibility, scattered clouds at 5,000 ft above ground level (agl), broken clouds at 9,000 ft agl, overcast clouds at 11,000 ft agl, temperature 17°C, dew point 17°C, and altimeter setting 30.19 inches of mercury. A strip of flattened corn plants led from the initial impact point on a northwest heading to the airplane. The airplane was resting inverted on a southeast heading about 100 ft from the initial impact point. The engine remained attached to the airframe. One of the propeller blades was bent, and the other was nearly straight. The flight control surfaces remained attached to their respective airframe surfaces, and flight control continuity was confirmed. The center fuel tank contained about 2 gallons of aviation fuel. At the recovery location, the spark plugs were removed from the cylinders. All displayed a normal worn-out condition when compared to the Champion Aviation Service Manual (AV-27). During a check of the engine's continuity, the Nos. 2 and 4 cylinders had normal compression. The No. 1 cylinder had weak compression due to a crushed intake valve pushrod, and the No. 3 cylinder had no compression due to a crushed exhaust valve pushrod. Both magnetos were rotated by hand and produced spark at all leads. The carburetor float bowl was removed, and no anomalies were noted. Examination of the airframe and engine revealed no evidence of mechanical malfunctions or failures that would have precluded normal operation. 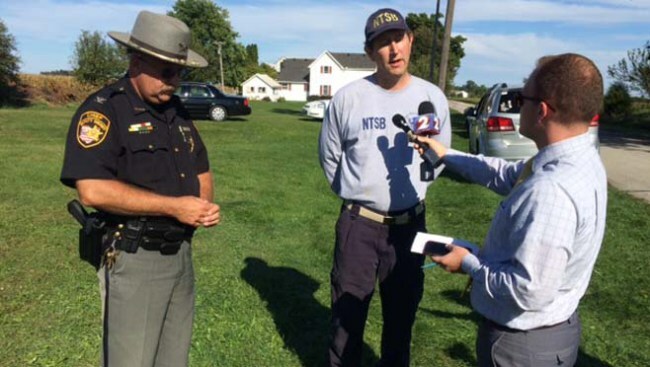 The student pilot had not reported any medical conditions or use of any medications to the FAA. The Montgomery County Coroner's Office, Dayton, Ohio, performed an autopsy of the student pilot, and his cause of death was determined to be multiple trauma. No significant natural disease was identified. The FAA's Bioaeronautical Sciences Research Laboratory, Oklahoma City, Oklahoma, performed toxicology testing on samples from the student pilot and identified ethanol at 0.105 gm% in blood and 0.134 gm% in urine. In addition, alprazolam and its metabolite hydroxyalprazolam; cocaine and multiple metabolites, including benzoylecgonine, cocaethylene, anhydroecgonine methyl ester, and ecgonine methyl ester; levamisole; hydroxyzine and its metabolite cetirizine; and naltrexone and its metabolite naltrexol were found in urine. Finally, benzoylecgonine, ecgonine methyl ester, hydroxyzine, cetirizine, naltrexone, and naltrexol were found in blood. The Montgomery County Coroner's Office also performed toxicology testing on samples from the student pilot. The testing identified 57 ng/ml of alprazolam, 161 ± 33 ng/ml of cocaine, 917 ± 190 ng/ml of benzoylecgonine, 404 ng/ml of ecgonine methyl ester, and 106 ng/ml of cocaethylene in heart blood. In addition, ethanol was found in heart blood at 0.139 ± 0.013 gm% and in vitreous at 0.095 ± 0.009 gm%. Alprazolam is a sedating benzodiazepine prescription medication used to treat anxiety available as a Schedule IV controlled substance and commonly marketed with the name Xanax. Cocaine is a strong central nervous system stimulant. Ethanol is the intoxicant commonly found in beer, wine, and liquor; it acts as a central nervous system depressant. FAA regulations prohibit any person from acting or attempting to act as a crewmember of a civil aircraft while having 0.040 gm% or more ethanol in the blood. Cocaethylene is a metabolite formed only when cocaine and ethanol are ingested together. Levamisole is a drug used to deworm animals; it is not available for use in humans. It is a white powder and is commonly used to cut illegally produced cocaine. Hydroxyzine is an anxiolytic often marketed with the names Atarax and Vistaril; it is known to be sedating. Naltrexone is an opioid antagonist available by prescription and is commonly sold with the names Revia and Vivitrol; it may be used in the treatment of opioid and alcohol addiction. Two personal electronic devices were recovered from the accident site and evaluated by the National Transportation Safety Board Recorder Laboratory. One device contained two short videos of the flight, each about 10 seconds long, that showed the airplane flying low over grassy areas but did not capture the accident sequence. Due to significant impact damage, no data was retrieved from the other device. For further details, see the Personal Electronic Devices Factual Report in the public docket for this investigation. On September 14, 2016, about 0915 eastern daylight time, a Piper PA-11 airplane, N4910M, impacted terrain while maneuvering near Arcanum, Ohio. The student pilot and passenger were fatally injured and the airplane was substantially damaged. The airplane was registered to and operated by a private individual under the provisions of 14 Code of Federal Regulations Part 91 as a personal flight. Day visual meteorological conditions existed at the time of the accident. The local flight departed without a flight plan from a private grass strip about 0800. 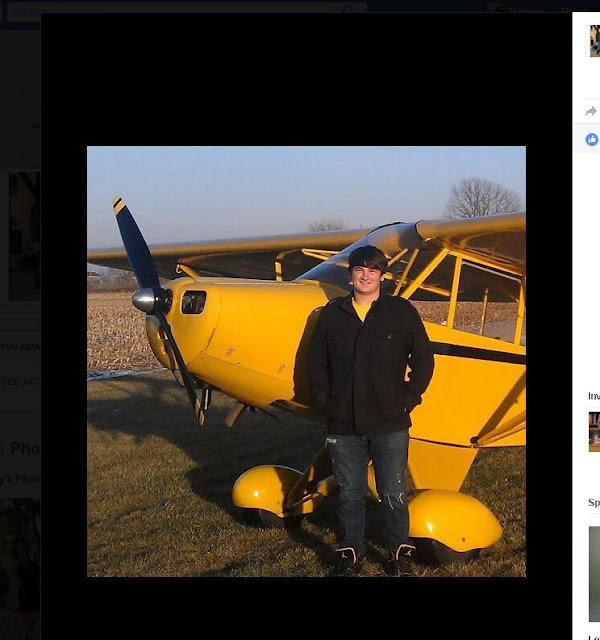 According to onboard video posted by the passenger to his Facebook page, the airplane was maneuvering near the grass strip, with the student pilot in the front seat and the passenger in the rear seat. 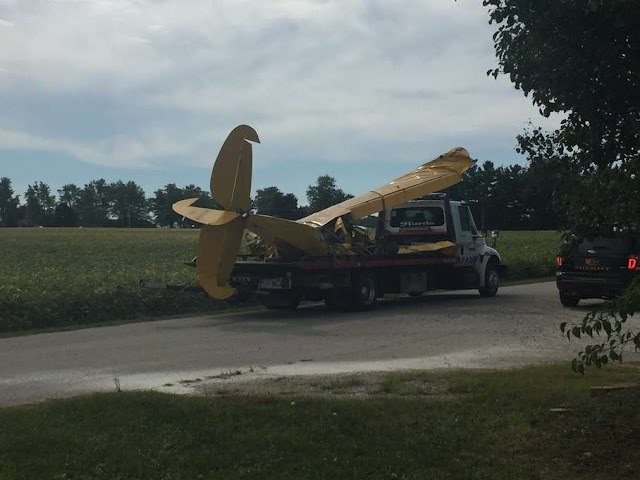 The airplane subsequently impacted into a cornfield about 300 yards north of the grass strip, which damaged both wings and fuselage. The airplane came to rest about 100 feet from the initial ground impact point. Our kids choose their own path, sometimes a fatal one and there is little we can do about it. Agreed. Sadly for the parents of the student pilot they are getting sued for damages due to the carelessness of their son from what I saw online. Which is a double whammy. He also soloed at 16 but 4 years later was still just a student? looks like his pathway didn't really include Aviation or what it takes to be an Airman. The regulations are written in blood and once again here is a glaring example of why students cannot carry passengers, much less recklessly and carelessly operate aircrafts under drugs and alcohol.